The problem with authors engaging in collaborative endeavors is that fans cannot help but compare the authors against each other. Such is the case with the Malazan world. 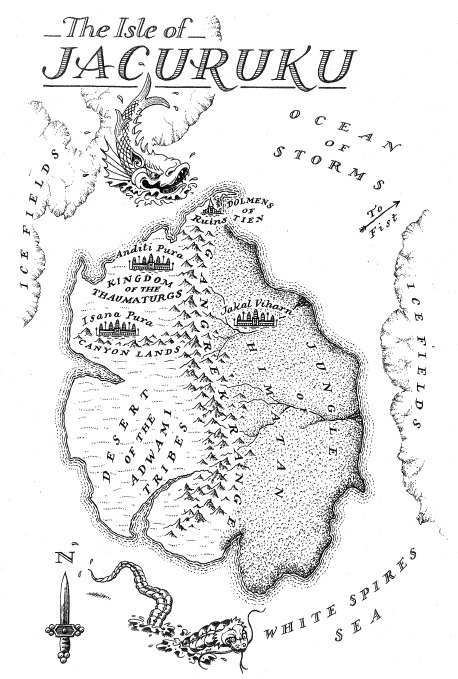 Although co-created by authors Steven Erikson and Ian C. Esslemont, Erikson is widely seen as the face of the Malazan world. This has much to do with timing. Both authors are working on aspects of the same overall story, but Erikson started and finished first, leaving Esslemont to fill in the details. For better or for worse, Esslemont has been stuck as the second fiddle, the Robin to Erikson's Batman. To be completely honest, I am one of the fans who sees Erikson as the face of Malaz. I tore through all of the Malazan Book of the Fallen a few years ago, finishing the series in the span of perhaps a month and a half. Having finished the series, I could never motivate myself to read Esslemont's contributions. After all, I know what happens to the Crippled God, most of my favorite Ascendants, the Bridgeburners and Bonehunters, and witnessed the end of the vast conflict that cleaved apart the Malazan world. Why spend more time in a story I already completed? Don't we keep reading to figure out what happens next? 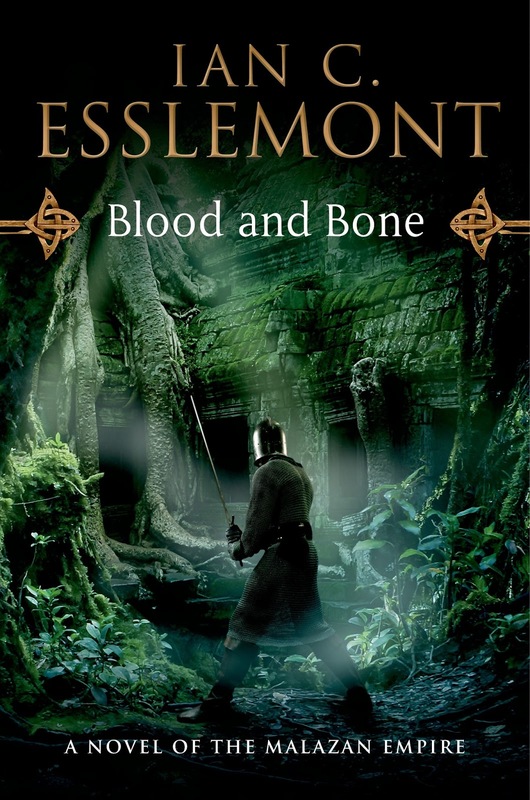 It was thus with some apprehension that I requested for review Bone and Blood, Esslemont's fifth book and newest contribution to the overall storyline. In retrospect, I am glad that I did. Blood and Bone does a fantastic job in capturing the overall spirit and feel of the Malazan world. The world is dark, gritty, powerful, and the site of extended power struggles among ascendants, gods, mages, warriors, and empires. Like all the novel's in Erikson's series, this book is set up as a power convergence. "Power draws power," after all, and this sets the stage for climactic scenes that test the limits of the human imagination. In Blood and Bone, which takes place roughly simultaneously with Erikson's The Crippled God, this power struggle takes place largely on the island of Jacuruku, the site of Kallor's ancient empire and the location of the ceremony that called down the Crippled God (or the Shattered God). Various groups are working their way through the island. But the plot is so complex that it would require too much space to do it justice (and truth be told, even after reading the book I am not completely sure what happened). Suffice it to say that there are a few main stories taking place simultaneously. The Crimson Guard is moving toward a final confrontation between the Avowed and the Disavowed. A Thaumaturg army, led by a great mage, is waging a war on Himatan, a living jungle guarded by the ancient deity Ardata (who some call the Queen of the Witches). A Malazan force and a young girl with mysterious powers, Saeng, are also working their way through the Himatan. And further to the south, a foreign Warlord has united the desert tribes and convinced them to wage war on their Thaumaterg enemies. Esslemont does a fantastic job of world building, some of the best I have seen in quite some time. He brings to life the threatening yet wonderful jungle of Himatan. And compared with most of Erikson's books, where the setting is secondary to the overall plot, in Blood and Bone Esslemont makes the setting (the jungle of Himatan) central to the overall story. In this sense, Blood and Bone far exceeded my expectations. Himatan is hot, humid, strange, and menacing in ways that draw every character into its dangerous embrace. The jungle's native populations can either be inviting and peaceful or dangerous and cruel. And the travels of various characters through the jungle's depths at times reminds of Joseph Conrad's Heart of Darkness, with all its implications of an impending conflict between civilization and savagery. Blood and Bone is intelligent in its treatment of historical and real world issues. I was struck in particular by the "rational" Thaumatergs' desire to colonize and "civilize" the savage jungle in order to put it to "productive" use. Partly, this can be read as man's struggle for ascendancy over the natural world. But in his execution, Esslemont may also be hinting, in a nuanced way, at the ideological underpinnings of colonialism and imperialism: that the colonizer actually believes in his power and progressive mission to uplift the colonized. Equally powerful was Esslemont's foray into the ethics and cruelty of pure, unadulterated rationalism and empiricism (when taken to extremes). But in all honesty, Blood and Bone is at times confusing. Esslemont weaves a few too many character threads into the overall tapestry, and does not have sufficient time to develop many of them fully. Further, he has a maddening tendency to play coy with his readers. He poses many more questions than he answers, and many times leaves readers in the dark about what actually happened. In fact, I felt much more in the dark after reading Blood and Bone than I did after reading any of Steven Erikson's books (outside of, perhaps, Gardens of the Moon, the most uninspired book of Erikson's series). Because of this, the Osserc and Celeste story lines in particular disappoint, and leave the reader wondering why they were included and whether they contributed to the volume in any noticeable way. Further, Esslemont's attempts at humor often fall flat. Esslemont simply lacks Erikson's flair for comic relief. The relationship between Golan and Chief Scribe Thorn (and Murk and Sour) did in fact make me smile at times, but Esslemont just cannot pull off the sarcastic, sharp-witted hilarity that Erikson keeps in his arsenal. Expect no Tehol Beddict and Bugg, nor an Iskaral Pust on his cantankerous mule. The humor in Blood and Bone just feels too forced. This does not take away from Blood and Bone's achievements. Blood and Bone does not disappoint; it is a great addition to the Malazan world. Esslemont weaves a detailed and complex tapestry, one that fans will have a fun time unraveling. He creates a lush background and overall world that perhaps surpasses that of any other book in the Malazan world (at least the ones that I have read). He fleshes out the broader timeline and the story of the Crippled God. And, lest I forget to mention, the book is a real page-turner. But at the same time, this book strikes me as a cautionary tale on collaboration among authors. 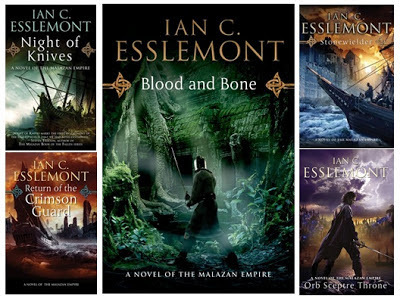 Esslemont's series would have been much more effective had its releases been timed alongside Erikson's (the ones that take place roughly at the same time). No doubt, that was the original intention. But the fact that readers have to wait years to catch up in a story that is already complete diminishes the impact of Esslemont's (albeit very good) contributions (granted, it does give him an immediate and powerful market...). In the end, Blood and Bone is an enjoyable read, great for committed fans of Malazan Book of the Fallen. But owing to this issue of timing, in particular, I wonder whether it has the power to attract a broader readership outside the most committed of Erikson's fans. Bonuses: +1 for Himatan; +1 for more of Gothos's awesomeness. Penalties: -1 for leaving the reader with many more questions than answers; -1 for too many story lines and a convoluted plot.